PJ is installing crown molding in his small New York City apartment. His question is about splicing two pieces of crown molding together. Dear Ken: I stumbled upon your site yesterday while searching Google for “how to paint crown molding.” You have done a fantastic job, as there is nothing else like your site on the web dedicated to molding. Well done, I love it. Some background: I am putting up crown molding for the first time in my 550 square foot apartment just outside of New York City. The ceilings are concrete and the walls and corners are far from square, which has made this job quite challenging for a first timer. I have glued small wood triangles cut from a 2×3 board into the corners of the walls to act as anchors. Unfortunately, I didn’t come across your site until after I bought and put up the molding. If I could do it again, I would try something with multiple layers. Q I have a seam (at about half of the distance of the wall) in the molding. I matched up the pattern of the molding at this seam as best I could, but there is a slight overlap. Any suggestions on how to sand/wood putty this seam? I am apprehensive to start sanding out of fear of doing damage that cannot be undone. The way it looks right now is not terrible, but I would like to blend the seam better before I start painting, as I am aware painting will make the seam even more noticeable. Any suggestions would be greatly appreciated. Thank you for the fantastic website. A Hey PJ, thanks for the compliment, I’m glad you’re finding our site useful. I totally sympethise with your crown molding dilemma — rooms way out of square and a concrete ceiling to contend with. Yikes! Did you glue the two mating faces of the joint? If you did, excellent. If not, the joint will separate over time with changes in temperature and humidity, and you’ll just have to live with that unless you do the installation over again. Do you have a power miter saw or a manual miter box? If you have a power miter saw, then I highly recommend you remove the over-lapping molding and shave that 1/32 of an inch or so off to make it match. Doing the same thing using a manual miter box with a back saw would make it very difficult indeed. My method for blending a scarf joint is the same for any type of molding, so you can apply them to your crown, which, I might add, you did an excellent job of matching the scarf joint with such a detailed crown molding. Start with 80 grit sandpaper. Sand a piece of scrap molding first to see how the molding material behaves under such a course grit. MDF moldings are made from many different formulas, and the cheaper kinds tend to shred under a course grit sandpaper, so that’s what you’ll be looking for with your test sanding. Cut out manageable size pieces. With the 80 grit, sand back and forth about 6″ on either side of the joint. This is going to take some time to blend the bulk of the material down, but it can be done. You will sand away the primer, and that’s a good thing because it will help you concentrate your efforts. When you can barely feel the raised joint, then smear the whole joint with a fine coat of spackling and let it dry completely. 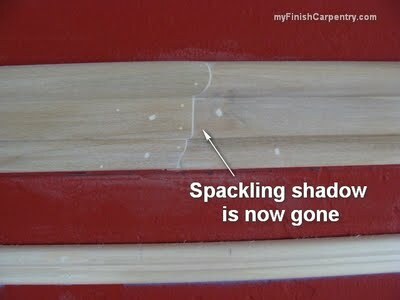 When the spackling is completely dry, sand the whole joint again with finer sandpaper, like 150 grit. At this point you are not trying to sand the joint. Rather, you are only looking to see how much spackling is left — an indicator of how much molding material is left to remove. 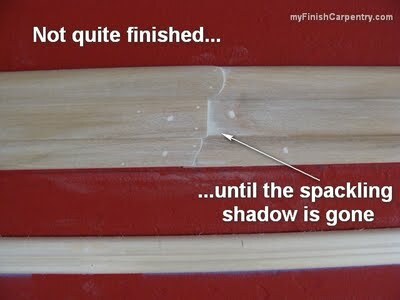 When you’ve blended the joint to perfection like in the picture rail post, you have to prime the sanded area (maybe even twice) sanding lightly between coats. The last step is to paint the crown and enjoy your perfect scarf joint! Crown or picture rail molding — same technique. Sand about 2″ across both sides of the joint. Perfection. 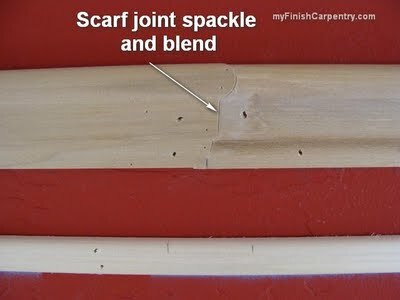 This scarf joint will not show under your paint. Update PJ has since removed and replaced the crown molding he installed. He’s working on the paint job now and promises to send pictures when it’s all finished. Check back later to see how his project turned out. Ken, insightful and very detailed explanation! I wish I had this information when I installed my mantle shelf! I glued my scarf joint together but couldn’t quite get the pieces to match just right. Same stock and everything. I think the key was the pre-sanding you recommend. To this day no one has noticed but I do. After pointing it out to a friend he said, “that’s what gives it character.” I have a nice sturdy mantle shelf, with character! I remember you worked hard designing and installing that mantel shelf, but it came out great. What’s going to be your next molding project? My next project besides finishing the upstairs bathroom is to redo the wall surround for our fireplace under the mantle shelf. There’s a couple local suppliers of manufactured stone in Poulsbo and Sequim, WA, that I may use. It’s fairly cheap, light, and easier to install than regular stone. Give it a nice cobble feel from all those trips to Wolf Bar in the Olympics. Once that’s done, I will plan to trim out the living room, dining room, and kitchen. It’s all open/merging space so once I start one spot, might as well continue all the way around.